Died: 1886, London, United Kingdom. 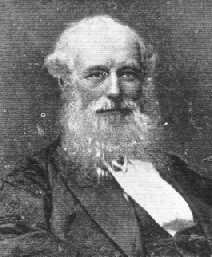 George Eveleigh of London, Doctor of Medicine (MD) and member of the Royal College of Surgeons (MRCS), was for some time a doctor in Calcutta (now Kolkata, India). He came to the Cape Colony in or before 1837, for in that year he applied for permission to practice there as surgeon, apothecary and accoucheur. He was a medical officer in Riversdale for a short time and then became district surgeon of Simon's Town and Swellendam. While in that position he married Johanna Titia Borcherds (1815-1896) in May 1838. A few years later he published a paper on "Further experiments in reeling the silk from the cocoon of the Eri worm" in the Journal of the Agricultural and Horticultural society of India (1843). In 1846 he wrote a long letter to the South African Commercial Advertiser (Cape Town) in response to a pessimistic report by Captain John Davies on the prospects of copper mining in Namaqualand. Eveleigh, who had not visited the territory and seems to have known little about geology, claimed that substantial deposits of copper and other metals would be found there. He argued that Namaqualand lay on the rim of a large ancient basin, the opposite side of which was in South America. Hence the same minerals that had been found in South America should also occur in Namaqualand. In 1853 Eveleigh wrote to the government in connection with a geological survey of the colony. (Such a survey was carried out by Andrew Wyley* during 1855-1859). Towards the end of that same year he was appointed professor of physical sciences at the South African College in Cape Town. However, he taught only chemistry during 1854 and initially demanded large sums of money for apparatus and other expenses, while proposing to do little teaching. Some of his chemical apparatus was acquired on loan from the South African Library. He does not seem to have settled down comfortably as an academic and resigned his post in 1855. The next year he applied for an appointment as magistrate and district surgeon to the Scottish immigrants at Plettenberg Bay. Later he appears to have been involved in a business venture with one John Gale, for in 1882 they were declared insolvent. He and his wife moved to London at some time, where he died around 1886. The Anglo-Indians at the Cape. Bygones and Byways, 19 March 2012. http://bygonesandbyways.blogspot.co.za/2012_03_01_archive.html retrieved on 21 October 2016. Immelman, R.F.M. A Mechanics' Institute in Cape Town (1853-1878). Quarterly Bulletin of the South African Library, 1956, Vol. 11, pp. 17-27. National Automated Archival Information Retrieval System (NAAIRS). http://www.national.archives.gov.za/naairs.htm Documents relating to Eveleigh, George. South African Commercial Advertiser, 14 March 1846, p. 2: "Mines in South Africa".